In a food processor process the almonds until finely ground. Add the garlic, parsley and Parmesan; pulse 4-6 times. Add in the 1/3 cup extra virgin coconut oil and 1 teaspoon salt (or to taste) and pulse again a few times. Set aside. Spiralize the zucchini or use a grater with the zucchini lengthwise to get longer strands. Preheat a large skillet or wok over medium-high heat with 1 tablespoon extra virgin coconut oil. Cook the zucchini for 4 minutes using tongs to stir and rotate until cooked through, about 5 minutes. 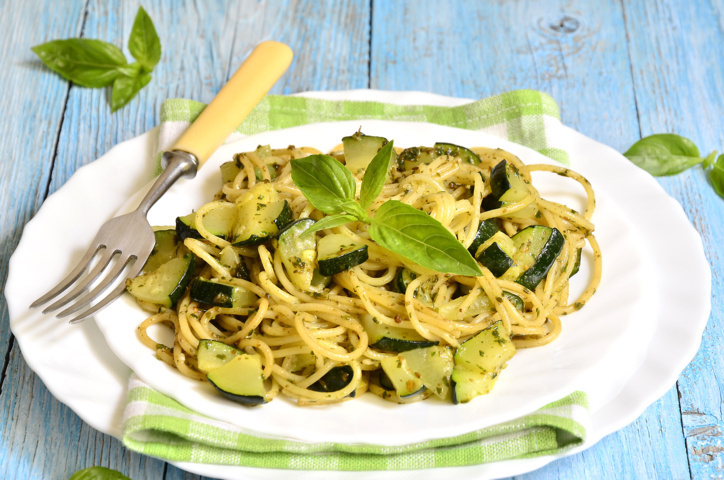 Toss the warm zucchini with the pesto, sprinkle with the crushed red child pepper flakes (optional) and divide into pasta bowls. Season with additional salt and pepper to taste. Serve immediately. Note: to roast raw almonds, heat oven to 350°F, toss nuts on a sheet pan and roast for 10 minutes. Cool before using.